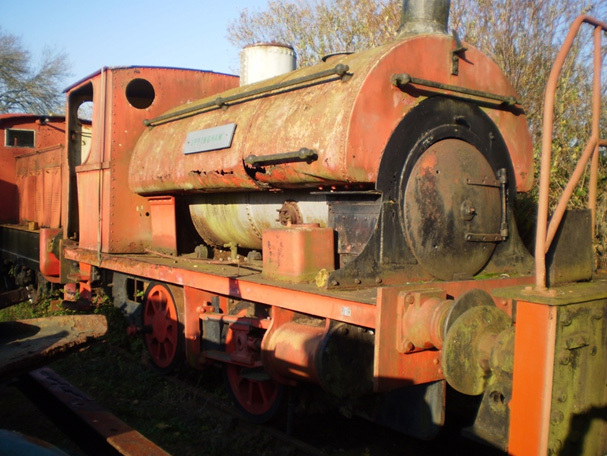 Uppingham is the sole surviving locomotive operated by the quarrying entrepreneur James Pain. The locomotive of Peckett Class R2 was delivered new on 11th November 1912 to the ironstone quarries that James Pain was developing at Uppingham. The quarry line connected to the LNWR Seaton to Uppingham branch. The initial quarry, known as Glebe Pit was in full production by 1914 and shortly followed by a second quarry known as Adderley Pit. The quarries suffered in the post war slump in the steel industry and they closed in mid-1925. Shortly afterwards UPPINGHAM was transferred to the James Pain quarries at Market Overton in Rutland. UPPINGHAM worked at Market Overton until put through Holwell Works for overhaul in 1947 and then transferred to the Wirksworth quarries of Bowne & Shaw Ltd, by this time part of the same Stanton group. UPPINGHAM is best remembered by enthusiasts who made the trek to see the locomotive working into the 1970’s along with fellow ironstone survivor Black Hawthorn “HOLWELL No.3” dating from 1873 and now preserved at Beamish in the North East. The locomotive was purchased upon retirement and a tentative restoration began as part of the Midland Railway Trust collection then housed at Normanton Barracks in Derby. After many years in storage the locomotive only survived as a kit of parts until rescued by one of our members given its significance to our collection and to the local area. Uppingham returned to Rutland in June 1978.